The foundation Stadt en Natuur Almere (city and nature) has as core objective to bring its visitors in closer contact with nature. Come and see the city estate De Kemphaan. Experience first-hand what can be found and done in this magnificent natural area. 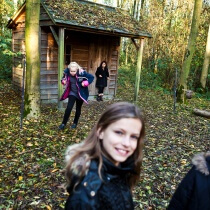 Stad en Natuur provides education about nature and culture. Target groups are child care instances, schools and the general public, among other. Intention is to inform visitors about the many possibilities offered by the surroundings of Almere. The foundation runs several centres, all situated near Almere. Stad en Natuur wants that visitors of all ages experience nature at and around Almere as direct and accessible as possible. And it tries to teach them something new and different at each centre. Each of the centres indeed has its own specific characteristics, functions and activities. What all of them share is the core intention to serve as a centre for education, recreation and meeting. 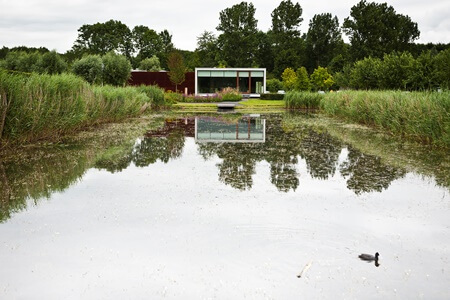 The foundation sees De Kemphaan as a perfect location to get people in closer contact with nature: The many nature activities offered there at the estate let people get in touch with nature in especially interactive and instructive ways. 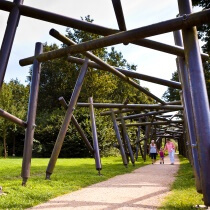 Together with other partners who also are located on the premises of the city estate, the Stad en natuur foundation offers, among other, guided tours and interesting hiking routes passing along “old” cathedrals. Like to experience Almere’s nature? Come over and discover it at De Kemphaan. Near the Stad en natuur centre and the Kemphaan estate there is a large city forest area. De Kemphaan is situated in the biggest deciduous forest of Almere, the Almeerderhout. This forest area actually consists of several forests among which the Waterlandsebos, the Cirkelbos, the Schapenbos and the Kathedralenbos. The forests have much to offer. In each of them various nature activities can be done, such as the Zintuigenpad, the ‘path of the senses’ or a hiking tour along the Gooimeer creek. 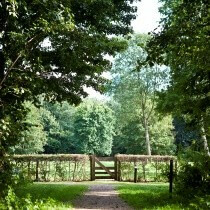 The city forests surrounding the Kemphaan estate are the perfect area for a beautiful hiking tour – or a pleasant exploration by bicycle. A variety of hiking and cycling routes leads through these forests. All of them are clearly marked which also means, you’ll be free to enjoy as much nature as possible. The forests are extensive and there is enough to do and to explore. And of course the hiking or cycling routes will also lead you along most beautiful, special places of interest. There is a lot to do at the Kemphaan estate. Kids can frolic around and play to their heart’s content: In the forests, for instance, searching there for dwarfs. Or they can follow small paths leading to a tree hut, a camp fire place or to the house of Little Red Riding Hood. Apart from the forest paths they can also spot the animals at the sheep stables. Sheep, goats and pigs of the estate can be found there. All centres including their activities teach about and deal with the surrounding nature. Thanks to these many different centres and locations, Stad en Natuur is able to offer its visitors a great variety of possibilities. So make sure to check our website very soon, for more information and to see what you can do at each location!